Ideas get fixed in names. For much of this century surgeons treated a hiatus hernia as a muscle to be repaired, a rim to be snugged or an organ to be tethered. In 1951 Allison1 put an end to this preoccupation with bulging stomach and showed that the symptoms of an ordinary sliding hernia derive from gastro-oesophageal reflux rather than the supposedly throttled stomach implicit in the name of the condition. 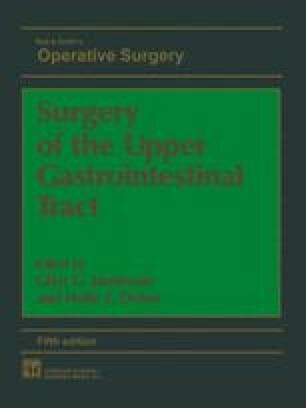 Although Allison’s thesis proved to be correct his repair failed the test of the follow-up clinic; it remained for Belsey and Nissen, more or less simultaneously, to develop useful and more durable operations to curb reflux. Nissen’s fundoplication was a serendipitous discovery. Belsey’s Mark IV operation2, on the other hand, was the culmination of operative trials and years of observations in the endoscopy suite and follow-up clinic of Frenchay Hospital. Both operations may be performed through the chest; the Belsey operation must be done via that route.